Download "Turning the tap off! 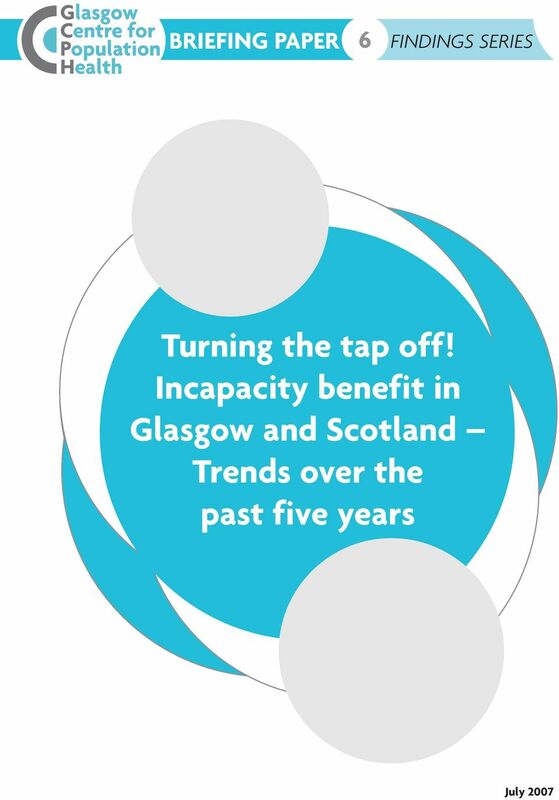 Incapacity benefit in Glasgow and Scotland Trends over the past five years"
6 FINDINGS SERIES BRIEFING PAPER FINDINGS AND CONCLUSIONS This report examines the stock of incapacity benefit (IB) claimants and investigates the on and off flow. 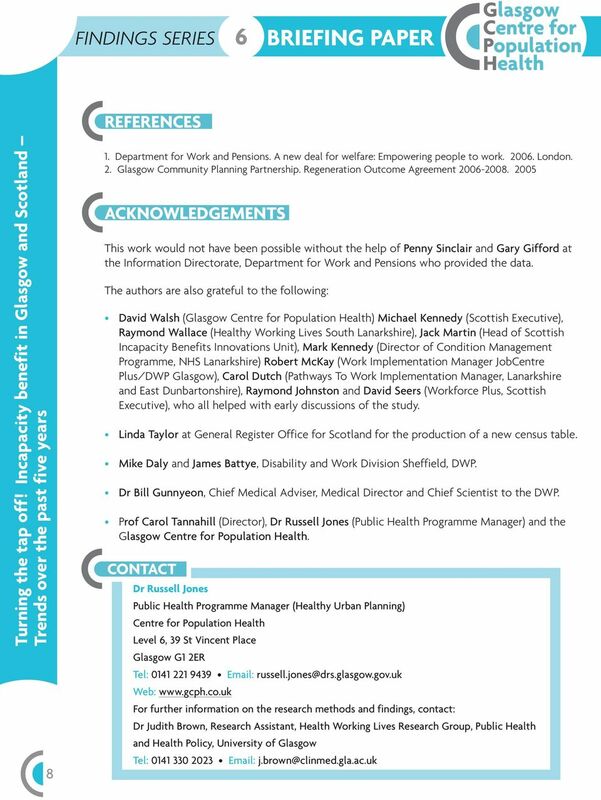 This is the first stage of a study that will further investigate the interaction between the health status, the labour market and policy interventions as they affect this vulnerable population. 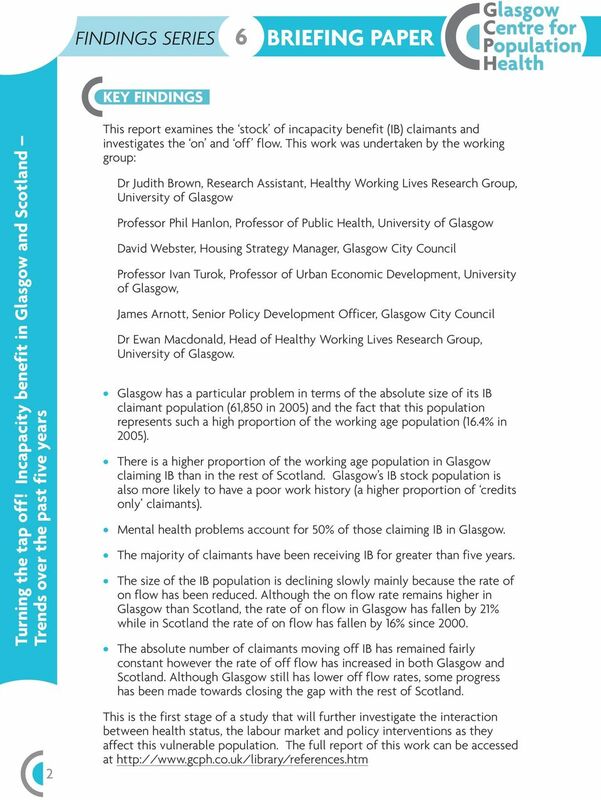 The IB stock population Glasgow has a particular problem in terms of the absolute size of its IB claimant population (1,850 in 2005) and the fact that this population represents such a high proportion of the working age population (1.4% in 2005). 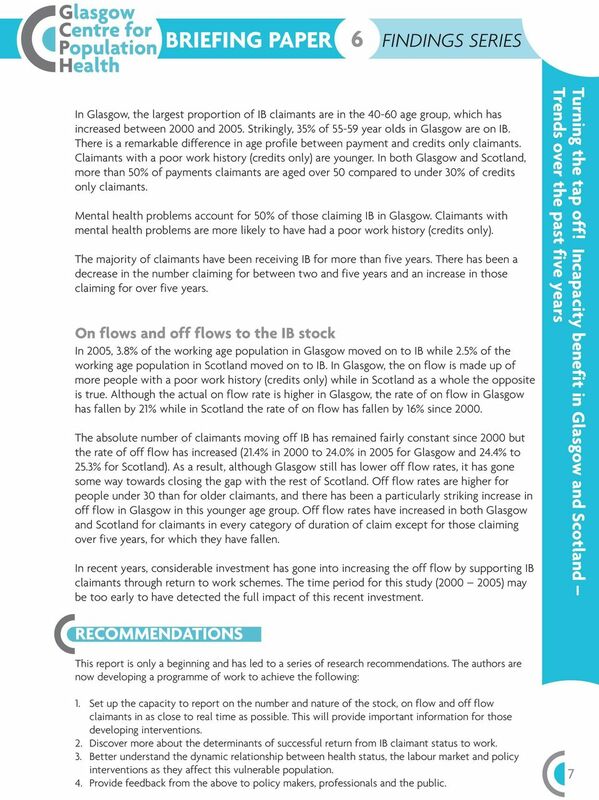 Between the years 2000 and 2005, there has been a reduction in IB stock claimants in Glasgow and the rest of Scotland. This is mainly due to a decrease in on flow. 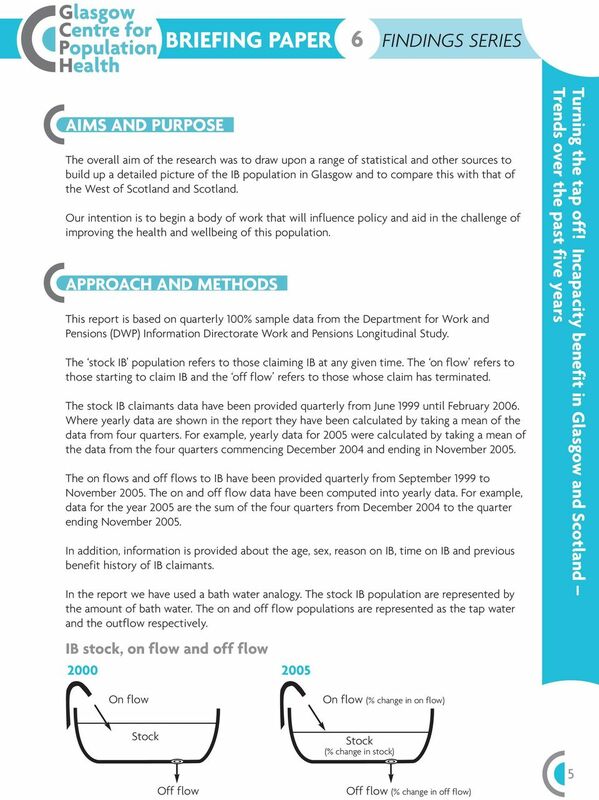 Stock IB claimants, On and Off flows in Glasgow in 2000 and Stock IB claimants, On and Off flows in Scotland in 2000 and ,000 84,730 7, ,770 14,510 81, ,110 (-19%) 1,850 (-9%) 70,50 (-17%) 323,10 (-4%) 14,850 (+2%) 81,80 (0%) There is a higher proportion of the working age population in Glasgow claiming IB than in the rest of Scotland. 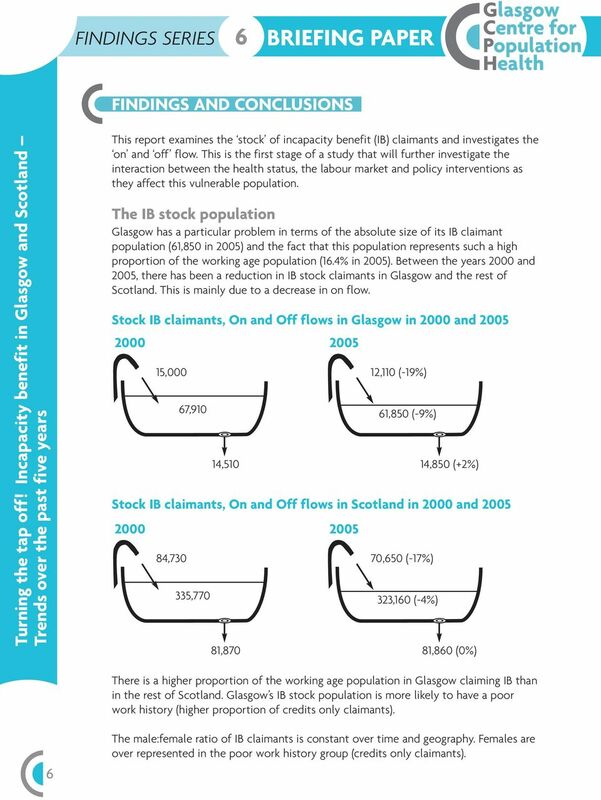 Glasgow s IB stock population is more likely to have a poor work history (higher proportion of credits only claimants). The male:female ratio of IB claimants is constant over time and geography. Females are over represented in the poor work history group (credits only claimants). 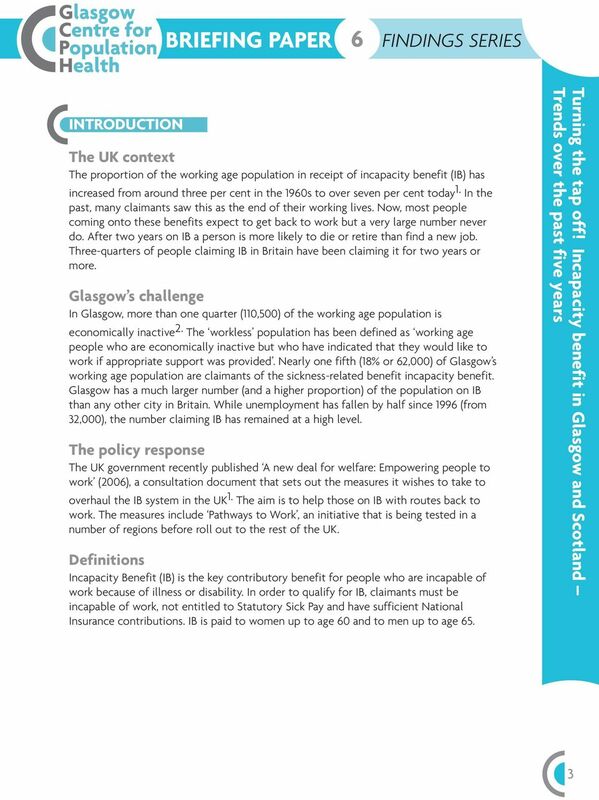 WELFARE TO WORK POLICIES IN THE UK 1 THE WORKFARE CONSENSUS Anne Daguerre* In the UK the system of unemployment protection has been characterised by the continuous development of means-tested benefits. This guide is for new applicants to the Financial Assistance Scheme. 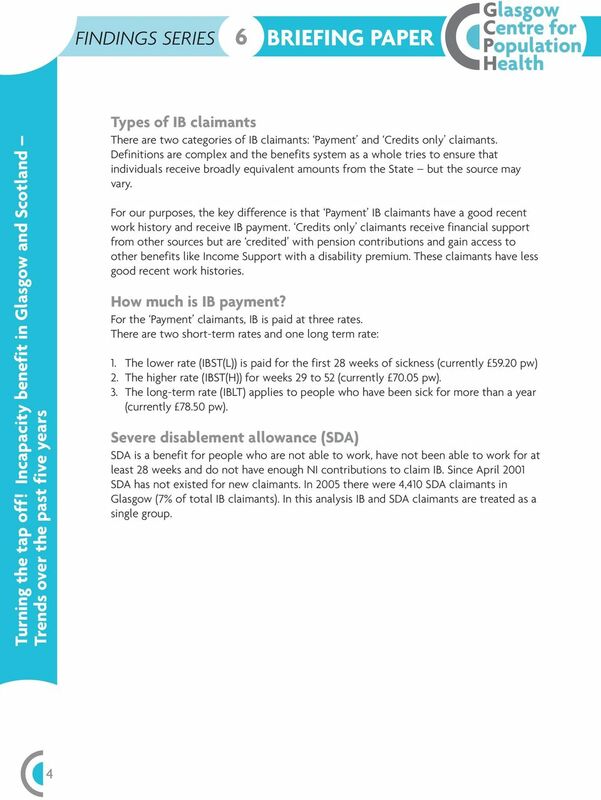 EXPLANATORY MEMORANDUM TO THE UNIVERSAL CREDIT (CONSEQUENTIAL, SUPPLEMENTARY, INCIDENTAL AND MISCELLANEOUS PROVISIONS) REGULATIONS 2013. 2013 No. Tax efficient Income Protection for the small business. The Structure of the Labour Market Vani K Borooah University of Ulster Readings Vani K Borooah, Globalisation, Barriers to Employment and Social Exclusion, Australasian Journal of Regional Studies, vol.